We have just got an update from AMD’s CPU, the new Athlon x4 845, with Carrizo microarchitecture. Carrizo is the latest and the last update for Bulldozer series, which received broadly negative views due to its low single-thread performance and high power consumption. Carrizo is a stop-gap solution for AMD before the official launch of new CPUs with Zen microarchitecture. It is intended for low-power APUs with power envelope of 15-35W. It is a confusing move by AMD to release Carrizo as a desktop part as the chip is supposed to run at a lower clock for mobile users (aka notebook market). And due to unknown reasons, the GPU part of Carrizo for desktop is not enabled. The results suggested the move is a mixed one. 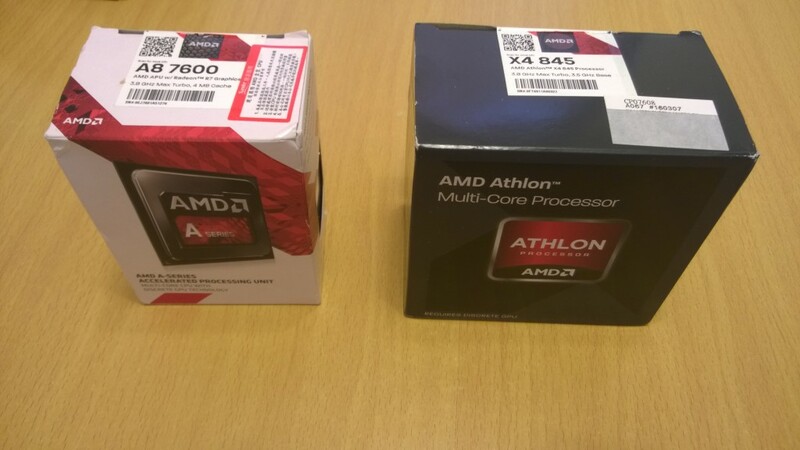 For the Carrizo CPUs, AMD listed 2 models with Athlon x4 845 and Athlon x4 870k. We have got an Athlon x4 845 for test along with the previous APU, A8-7600. Credit to imamage for A8-7600 and Athlon x4 845 for test. The cooler for Athlon x4 845 was the new cooler.